Each Friday we are going to feature a member of our community, Business Owners, Musicians, Artists, Teachers, Community Leaders and those that inspire us. This week we have Shannon Carmack-Mize and if you have been to a local theatrical performance at Gallo or Downey in the last few years you have seen her handiwork. She is often times seen at local events taking pictures of her daughter and other costumers entertaining children of all ages. Shannon Carmack-Mize but some of the teenagers call me “Sha-nan-a-mom” because I’m everyone’s mom in the theatre. In front of my sewing machine or backstage at Gallo. What do you do, What is your story? My own kids got into musical theatre over ten years ago so I started volunteering to help – which eventually led to costuming full shows on my own. 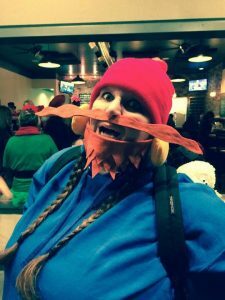 It also started a sidebar of creating over the top costumes for my kids which is how we got into volunteering with a local costuming group(Central Valley Costumers) that does community service. I am passionate about giving teenagers a safe place to be themselves. How did you know? My first experiences in theatre costuming were in children’s shows and I noticed that some of them were self-conscious about how their costume looked or felt and even though we were only providing a costume, they all seemed to need something else as well – and it was different for each of them. So I started listening and watching and helping where I could. I remember hundreds of children’s names and I remember whether they were a tree or a raccoon or a giant cookie 6 or 8 or 10 years ago. Now, when I costume my own shows, I listen to what the kids and teenagers say and sometimes more importantly, to what they don’t say, I watch how they interact with each other, who needs attention, who needs a quiet place to sit, who needs someone to listen, who needs to feel comfortable in their costume because they aren’t when they wear their real clothes, who needs to be reminded that they’re part of a company and not Sutton Foster yet, who needs to be seen, and sometimes I link up kids who need each other together without them realizing it. I am the safe place backstage and at rehearsals – they can all approach me and feel safe. Even in a group of kids that they think is too cool for them normally, they can come to talk because I’m there and I make the field neutral. My sewing table backstage is like a community gathering space. All are welcome and I can usually be found repairing or sewing something while 20 teenagers talk comfortably around me. Tell us about a project or accomplishment that you consider to be the most significant? I consider them all significant. Teenagers are at a rough patch – the emotional center of their brain is growing way faster than their ability to make practical decisions is. They are volatile and misunderstood, lonely and bored, happy and sad…and a million other things – all at once sometimes. If I can help provide them with a tether to something good and complete – like the family they make backstage – then that tether will always be there for them. You never know when those emotions might take a crazy turn up or down and they can hold onto that connection, contact a friend or look at pictures, play the soundtrack and sing along – and that tether becomes a lifeline, the memories of what that family felt like, what it feels like to know that the theatre is always their home – that can be the thing that keeps them afloat until the emotions ebb again. The next generation of theatre kids – Annie and Newsies. The Chris Murphy Question Beatles or Rolling Stones? Beatles. Always. There is no question.